"The end goal is to bring the perks you enjoy with your smartphone to your landline. It all starts with an app that's available on iOS and Android (in both phone and tablet-friendly formats) that functions similarly to Google Voice." 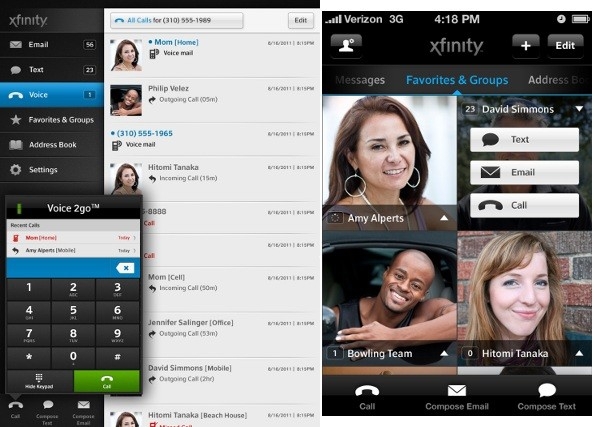 Xfinity Voice 2Go lets you answer or make free calls from a mobile phone or tablet over 3G, 4G, or WiFi using your home phone number. It supports concurrent ring on up to 5 different numbers and SMS messages. It also lets you pick up to four additional phone numbers that different members of your household can use for voice calls or SMS. I didn't see any mention of when this service will actually be available. I love Vonage but this is starting to sound pretty good. Would anyone switch to Comcast Xfinity phone service for these features?